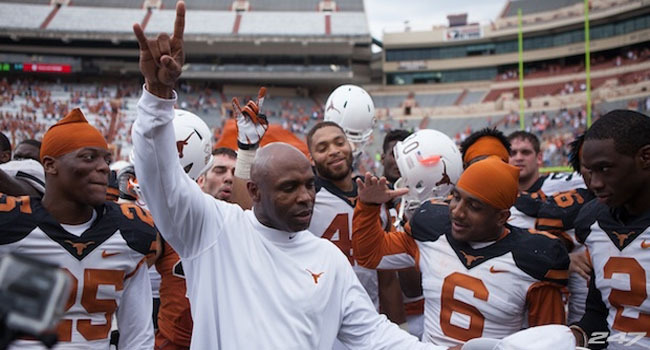 Can Charlie Strong and the 'Horns knock off Oklahoma? Texas (14.5) vs Oklahoma (O/U 47) – I have to say, I’m glad the Red River Rivalry has continued to stay at the original Cotton Bowl. I realize how easy it is to shift to Jerry World but I’m glad some traditions have stayed alive. I expect the Longhorns to play hard but I also expect a very ticked off Sooners’ team to show up as well. Trends: The total has gone OVER in four of Texas’ last six games when playing the Sooners… OU is 3-5-1 against the spread in their last nine games when playing the Longhorns… Texas is 2-5 straight up in their last seven games. Northwestern (+4) at Minnesota (O/U 43) – I’m sure all of you had this match-up pegged for the lead in the Big Ten West in the second week of October right? Well that’s what we’ve got. Both Nebraska and Wisconsin have already suffered conference losses. The Gophers are riding the wave of winning the Little Brown Jug two weeks ago while the Wildcats have scored impressive wins over Wisconsin and Penn State. Trends: The Wildcats are 4-3 straight up in their last six games Minnesota… The Gophers are 2-4 against the spread in their last six games at home against Northwestern… The total has gone UNDER in four of the Wildcats’ last six games against Minnesota. The Pick: The Badgers gashed the Wildcats’ run defense last week and I expect the same thing from the Gophers. Take them to cover and I like the UNDER. A win at Baylor puts Gary Patterson and the Horned Frogs in front of the Big 12 race. TCU (+8) at Baylor (O/U 66.5) – If the Horned Frogs can pull of another upset they’ll be well on their way to a Big 12 title since they’ve already beaten the other favorite in Oklahoma. If the Bears win, they still have a November date in Norman. Trends: The Horned Frogs are 4-2 straight up in their last six games against Baylor… The Bears are 14-1 straight up in their last 15 home games… The total has gone UNDER in six of TCU’s last eight games on the road. The Pick: Expect lots of scoring and take TCU while taking the OVER as well. Auburn (-3) at Mississippi State (O/U 64) – The Tigers are accustomed to these marquee match-ups while the Bulldogs are still getting used to them. Both teams still have Bama and Ole Miss on their respective schedules. That means a win is vital tomorrow. Trends: The Bulldogs are 2-11 straight up in their last 13 games against Auburn… The total has gone UNDER in four of the Tigers last five trips to Mississippi State… Mississippi State is 4-8 against the spread in their last 12 games against Auburn. The Pick: Take the Bulldogs getting the points at home and the UNDER as well. Oregon (-3) at UCLA (O/U 72) – This is an elimination game. Both have one loss now and a second automatically knocks them out of contention for the college football playoff. If UCLA follows Arizona State’s lead and runs the ball then they have a good shot at the win. Trends: Oregon is 1-4 against the spread in their last five games… The Bruins are 1-4 ATS in their last five games when playing Oregon at home… The total has gone UNDER in four of the Ducks’ last five games at UCLA. The Pick: I like the Bruins getting the points at home and I like the UNDER. Ole Miss (+2) at Texas A&M (O/U 64) – I said earlier this week that this is the type of game that programs who aren’t sued to big wins usually lose. The Rebels beat Alabama but will there be a letdown? Trends: Texas A&M is 6-0 lifetime against Ole Miss and 2-0 since they joined the SEC… The total has gone UNDER in five of Ole Miss’ last five games on the road… The Aggies are 1-4 against the spread in their last five games at home. The Pick: I expect the Aggies to cover and take the OVER as Ole Miss suffers their first defeat.